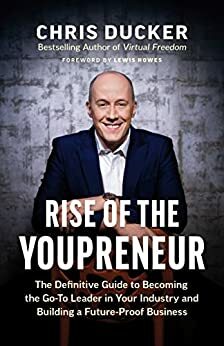 In late 2014, internationally acclaimed blogger and podcaster Chris Ducker coined the term “Youpreneur” to describe the rise of the personal brand entrepreneur, a new business model that very few people saw coming. Since then, the Youpreneur has risen to the top across sectors. A Youpreneur transcends the old rules of business and builds a sustainable business from the foundation of their experience, interests, and personality—their personal brand. Youpreneurs draw an engaged, loyal audience even as they pursue varying, changing interests. They play by their own rules, and they reap the benefits. Ready to pivot for the last time, guarantee the success of your business, and become the go-to leader in your industry? Chris Ducker will show you how to develop the Business of You and build a future-proof business model. Chris Ducker is the bestselling author of Virtual Freedom and founder of Youpreneur, the entrepreneurial mastermind community that helps experts become the go-to leader in their market. A true entrepreneur at heart, he has built several businesses since venturing into the world of entrepreneurship in 2004, which today collectively house over 450 full-time employees and generate a multi-seven-figure annual revenue. A highly sought-after keynote speaker, trusted international business mentor, blogger, and podcaster, Chris is featured regularly in Entrepreneur, Inc., Success, Forbes, The Huffington Post, and several other key media outlets. Relishing the opportunity to help build strategies for other passionate entrepreneurs that want to grow their businesses in productive and effective ways, Chris hosts several live events each year, including the annual Youpreneur Summit in London. Chris recently relocated back to the UK after many years based in the Philippines, and now lives with his wife and four children in Cambridgeshire. You can reach out to Chris directly on Twitter @ChrisDucker. —Pat Flynn, Wall Street Journal bestselling author of Will It Fly? Chris Ducker is the bestselling author of Virtual Freedom and founder of Youpreneur.com-the entrepreneurial mastermind community that helps experts become the go-to leader in their market. A true entrepreneur at heart, he has built several businesses since venturing into the world of entrepreneurship in 2004, which today collectively house over 450 full-time employees and generate a multi-seven-figure annual revenue. A highly sought-after keynote speaker, trusted international business mentor, blogger, and podcaster, Chris is featured regularly in Entrepreneur, Inc., Success, Forbes, The Huffington Post, and several other key media outlets. Relishing the opportunity to help build strategies for other passionate entrepreneurs that want to grow their businesses in productive and effective ways, Chris hosts several live events each year, including the annual Youpreneur Summit in London. Chris recently relocated back to the UK after many years based in the Philippines, and now lives with his wife and four children in Cambridgeshire. You can reach out to him directly on Twitter @ChrisDucker, or visit his personal website at ChrisDucker.com. 5.0 out of 5 starsA page-turner and truly inspirational. I was lucky enough to see Chris Ducker present at a Problogger event with Pat Flynn a few years ago. It was one of the funniest and value packed presentations I've seen. Since then I've followed his excellent podcast, his blog and his entertaining and educational posts on Instagram. Buying his new book was a no brainer, but I was still surprised by how much I learned from it. Chris is funny, down-to-earth and incredibly knowledgeable about personal branding and online business. I highly recommend this book to anyone who is interested in building a business around their personal brand. 5.0 out of 5 starsThis book is a must read!!! This book is delivered in an easy reading style- the information given to the reader is in bite size chunks. There are clear step by step processes that can be easily replicated. Chris has showed us the journey he has undertaken over the last couple of years and what has worked well and what to look out for. There are many actionable steps and links to additional materials. A great book to refer to time and time again. A wonderful practical guide. Thanjk you Chris. 5.0 out of 5 starsMagical Mr Ducker Mastery, when I thought it couldn't possibly get better! Fantastic, brilliant mastery by Mr Chris Ducker certainly has a magical way for the reader to not to come self-absorbed but to selfless unleash and give one's self-permission uniqueness to serve its mission in the world. Essential reading for every business owner. For someone who is just stepping out into this online digital world all I can say, after a year of taking 1 step forward and 3 back - START WITH THIS BOOK. I am so glad I found Chris and "Rise of the Youpreneur" at THIS moment. I have been working on my website, working on my Avatar - but the way he explains things I am very happily back on the drawing board - but this time with very wise guidance. Brilliant. Make the time to pour over this book and practice that he recommends. It will be the best business decision of all to get this foundation right. As a new online start up I thought I was on the right track but there were so many thought provoking ideas in this book that it propelled my marketing to a new level!